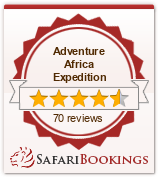 Kenyan Safari 6 Days Package 5 Nights Best Luxury Tented Camping & Kenya Lodge Tour. The whole day explore the parks amazingly high concentration of game. This game reserve is Kenya's finest wildlife sanctuary. Including migrants, well over 450 species of animals have been recorded here. Mara plains are filled with migrating wildebeest and zebra, there is also resident wildlife year round.The Mara's gentle fertile climate bounded by The Rift, offers perhaps the richest stocked reserve set within some 1672 sq kms - an unlimited spectacle of wildlife. Located 268 kms west of Nairobi, the emphasis here is on game. Herds of immense Elephants, browse among Lion, Buffalo, Thompson's Gazelle, Zebra and Topi. You may occasionally sight a Rhino or Leopard. In the Mara River Hippos play and Cross bask on the banks. The annual migration of a million Wildebeest follows the rains north. After exploring the park return to the same Luxury Camp or Lodge for dinner and overnight. Wake up call at around 0630am have just a cup of hot coffee and then proceed for the early morning game drive, then proceed for the game drive until 0930am when you will return to the Lodge for the main breakfast. After the breakfast check out the lodge and visit the Masai village where you will be entertained with the Masai dance by both Morgan's and women, then visit their houses (Manytta), have as many photos with the Masai as many as you can, there after proceed to Lake Nakuru with lunch on your way in Narok. Arrive Lake Nakuru in late afternoon and if time allows go for the game drive. Dinner and overnight in Lake Nakuru Hotel Kivu. On this day you will have your breakfast as from 0700-0800am, then check out the room as you proceed for the game drive until lunch time. After lunch check out the park and proceed to Amboseli and you will have your lunch on the way, after lunch head on to Amboseli arriving late afternoon, if time allows go for a short game drive and then return to the lodge For Dinner and over night in Amboseli Sentrim Luxury Tented Camp. Wake up call, then have a cup of hot coffee, then proceed for the early morning game drive, this will take you until 0930hrs where you will return to the Camp of Lodge for Main breakfast, there after you can decide to go for a short walk with the Masai Morans and then leave for Nairobi then you will be dropped back to the airport to catch up with your flight. arrival time at the airtime will be around 1530-1400hrs.